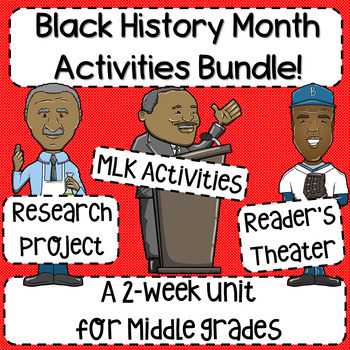 This resource is a 5-Act, 25-role reader's theater script for Black History Month! This product covers famous African-Americans and their lives and accomplishments. Reader's Theater is an engaging instructional strategy for middle grade students that allows them to act out various historical scenes. This resource is an engaging two-week unit for Black History Month! This product includes a research project, an in-depth study of Martin Luther King Jr., and a Reader's Theater. In the Black History Research Project, students will complete graphic organizers for ten famous African-Americans throughout history. There is also a matching quiz over the historical figures as well as an essay prompt and extension project ideas! 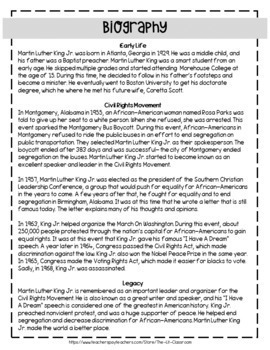 The Martin Luther King Jr. Activities product includes a vocabulary study, quick-write prompt, timeline analysis activity, and a biographical reading. 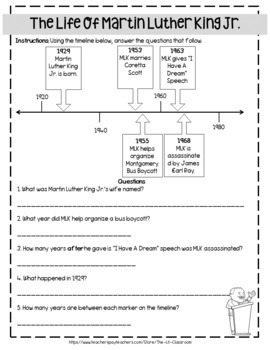 There are also three-leveled reading passages of King's iconic "I Have A Dream" speech with analysis questions. Lastly, there is an essay question and an exit slip as assessment options. The Reader's Theater also includes a quiz as well as an extension activity! 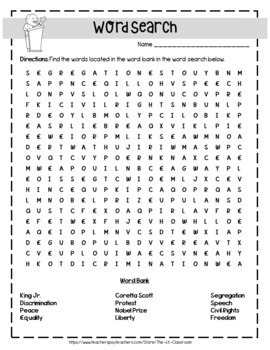 This resource is designed for middles grades Social Studies, but there are also great English Language Arts connections and skills that are developed!